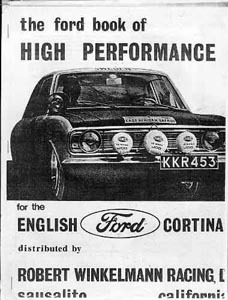 This was a sales catalog of Ford Cortina and Formula Ford racing equipment offered for sale by the California based Robert Winkelmann Racing Ltd. published in 1971. My copy is a photocopy of an original plastic-spiral bound booklet, but shows some nice images and descriptive text of the go-fast parts available at the time. And the prices! Alloy clutch housings for 30 US dollars! New-40 DCOEs for 87.50 each! Where, oh where, is my Time Machine when I need it? A limited number of reprints produced from the original plates are now available! Contact Bob Winkelmann for purchase price and shipping information!